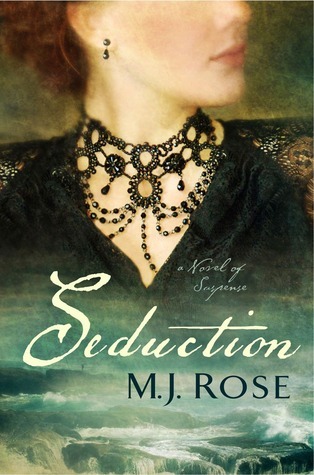 A novel of past lives, love, loss, history and understanding; a novel of sinister seduction. I'd probably give this book more of a 3.5 rating. I don't feel like the book lived up to it's claim as a suspense novel, although I love it as a part historical fiction. I absolutely love the author's writing style and ability to transport us in time with it, but I feel like the plot was lacking substance in value. At the end of the book I was left disappointed because, considering everything that happened in the book, nothing really happened at all. I suppose the purpose of this book was to get Jac to change, and perhaps provide an ending to this series, but that's really all I took in. It took me a while to get through this book, not because it was hard to get through, but more like it didn't grasp my interest long enough for me to want to keep reading more than one chapter at a time. There wasn't much pulling me through the book, but I must say I was greatly interested more with the Victor Hugo accounts of events than the present and B.C. tense. I enjoyed his aspects very much as he struggled to overcome the grief of losing his daughter, Didine, and finding life's purpose in Fantine. I understand how the entire situation with The Seduction (the devil's allure in times of grief) turned Jac's life around and changed her for the better, but after the final throes every once else in the story just dissipated with a flip of the hand, as if they never had any real importance in the book at all. In the end, this story is meant to symbolize people dealing with their demons and how they struggle to overcome them.